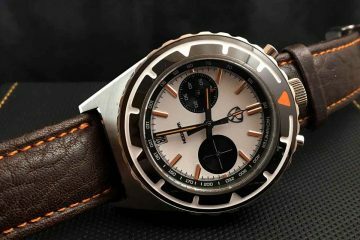 Ocean7 Watch Company’s newest model is the Ocean7 LM-8, a homage to a Rolex Deep Sea Sea Dweller (DSSD), but with enough of its own added features to not make it a blatant copy. A friend of mine had recently purchased a LM-8. He raved so much about it, I had him send it to me so I can do a hands-on review. First, we take a look at the packaging. Ocean7 delivers on both presentation and protection with their watch box. 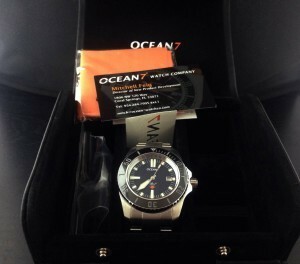 Ocean7 utilizes a very nice leatherette box, which houses the watch securely along with all the usual paperwork,warranty cards, and an Ocean7 polishing cloth. When we get to the watch, the first thing you will notice is this is a large watch coming in at 45mm wide. The case is 17mm thick, and has a lug to lug measurement of 56mm. The lug width is 24mm, so be prepared for a big, chunky watch. Housed inside the case is an ETA 2824 automatic movement. 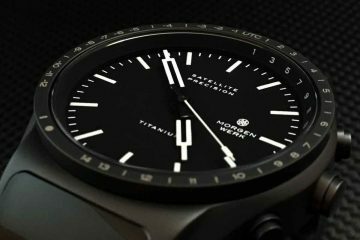 The dial is covered with an AR coated sapphire crystal, measuring 33mm, and is also equipped with a ceramic bezel. The case and bezel of the LM-8 remind me of a Rolex DSSD, but on steroids. The case is well constructed and is high polished, which unfortunately makes the LM-8 a fingerprint magnet. 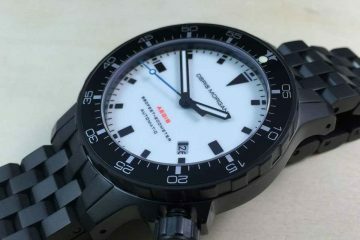 The dial is all Ocean7 though, using plongeur hands and a date window at the 3 o’clock position. 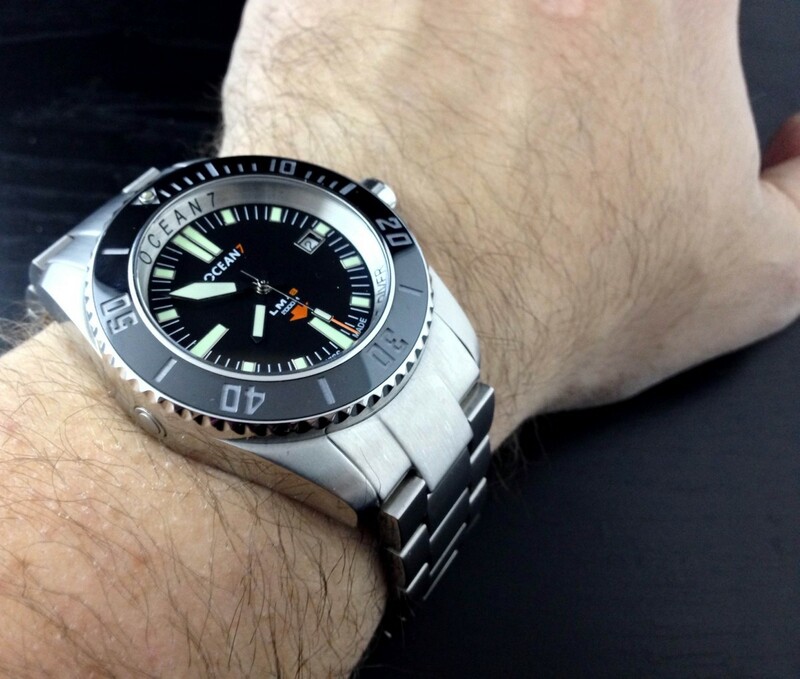 You will notice that the stainless chapter ring is mimicking the Rolex in that it is engraved with OCEAN7 at the top, and professional deep diver down below the 6 marker. I personally think this watch can stand on its own and didn’t need that engraving around the dial. If they had left that out it would be less like the Rolex DSSD and more like Ocean7. 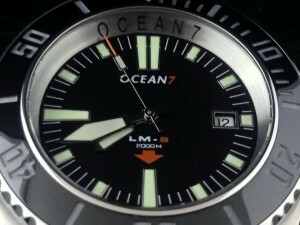 I love the ocean 7 watch. Yes it is bulky but that means it will be seen. I disagree about the engraving I think it gives the Ocean 7 alot of character.